Mini trousse There are 8 products. Small, round and charming - totally irresistible! Completely lined for keeping your beauty secrets, manicure sets or even your camera or phone. "Matin à Paris" is the small pouch that fits in any bag with everything we need to make us beautiful. A pretty canvas signed by batiste France Duval-Stalla is dotted with white stars. Small, round and charming, totally irresistible! Completely lined for keeping your beauty secrets, manicure sets or even your camera or phone. A very Haute Couture looking purse will hold all your little personal effects with great chic. It is perfect for both make-up and jewellery. 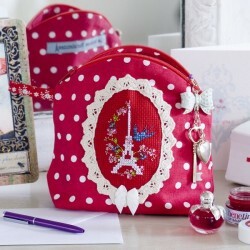 Its easy embroidery motif “Tour Eiffel en fleurs” makes it a delicate and quick to make present. A very Haute Couture looking purse will hold all your little personal effects with great chic. It is perfect for both make-up and jewellery. 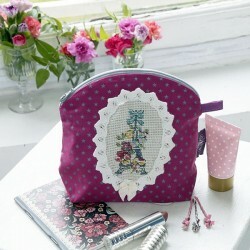 It's easy embroidery motif “Tour Eiffel en fleurs” makes it a delicate and quick to make present. 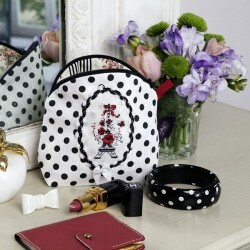 The softness of white and the elegance of black… Here’s a perfect bag for your make-up or your jewellery. It only takes a few cross stitches to complete the Eiffel tower intertwined in a Garland of flowers which makes it a delicate and quick to make gift. Necessary for the rehearsals or before the performance, this pretty pouch will never leave ballerinas and star ballet dancers. A small brush, the barrettes, a net, a headband or a makeup, everything will be on hand to be ready to shine like a star.